After passing my upgrade exam for General privileges back in July, I have been chomping at the bit to get on HF…especially the digital modes. I had been saving up for a new HF rig for several months prior to taking the test, and in August I put in an order for an Icom IC-7200 and a MFJ-993B auto tuner with DX Engineering. 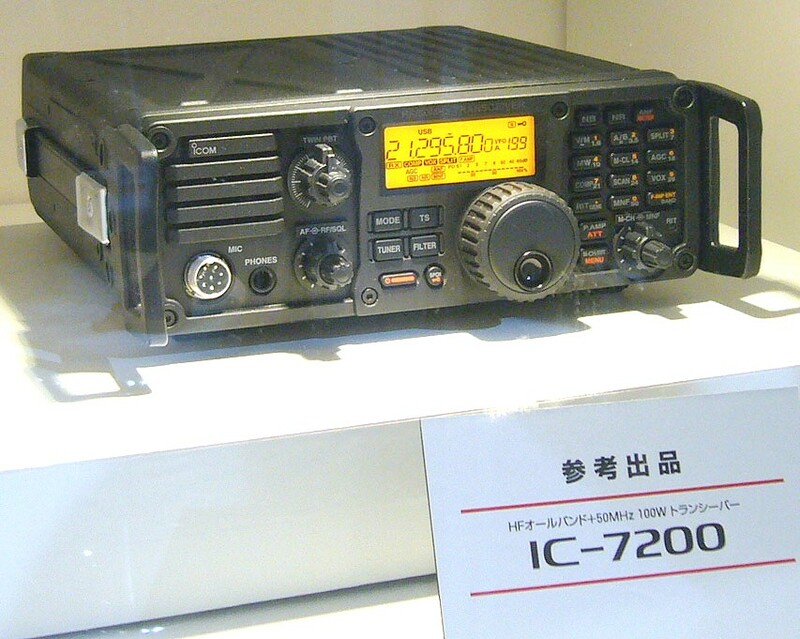 The 7200 has been on backorder for weeks due to a coupon offer from Icom, so I had to wait a bit on it. After my ship date got moved up another month, I decided to look around to see if I could find one available somewhere else. I was in luck…Amateur Electronic Supply out of Ohio had a few in stock that had just arrived. I gave them a call and within a couple days I had the unit; lucky for me, since the rig is now backordered everywhere! After consulting many websites and even posting some questions on eHam.net, I decided to go with a horizontal dipole as my very first HF antenna. I also decided to buy some of the parts and make the antenna myself. Everything came from DX Engineering: 150 feet of #18 antenna wire, 100 feet of 300 ohm ladder feed line, center and end supports, nuts, bolts, etc. I simply cut the antenna wire in half, giving me 75 feet on each end of the dipole. After soldering connectors and getting it all setup, I strung it between two trees in the backyard about 6 feet off the ground…just to test the SWR and the RX capabilities. Everything seemed to work great…at least at ground-level over a week-long test period. It even survived being examined by our resident male black bear. It wasn’t until yesterday that I was able to get things prepped to install the antenna at it’s final height, high up in a hickory and a pine tree in the front yard. So how was I going to get the thing up into the tip-top of the trees like I really wanted? I decided to go the unusual, but very cool route of using a pneumatic tennis ball launcher. I bought all the parts I needed, painted, primed, and cemented the PVC, and let the launcher dry overnight. This morning I test-fired it with 80 PSI…one word, WOW. It launched a tennis ball filled with 22 pennies to a height of 50 feet and a distance of about 200 feet! I was very impressed, but would have to dial-down the PSI for my needs. I actually got the ball stuck in a tree on the first test, simply because I didn’t expect it to go so far! For trees in our area, 40-50 PSI is plenty of power to get the ball to about 80 feet or so in height. Dipole installed at ~60 feet AGL. So today was spent launching balls and hoisting Dacron rope into trees. I must say I was very happy, it only took one shot to get the rope in the top of one of my hickory trees, and only two attempts to get it into the large pine in the yard. The antenna stretches between a large Shortleaf Pine that’s about 70 feet tall in the backyard and a hickory in the front that’s about 60 feet tall. The dipole slopes slightly downhill towards the hickory since it’s further downslope, off toward the NNE direction. Dipole installed and ~80 feet ladder line. I decided to put a marine-grade, stainless steel pulley on the end at the pine tree. I also added weights, about 15 pounds to the rope running through the pulley to the antenna; this allows for some sway and give if there are high winds and the trees decide to move. All in all, the antenna is at about 60-65 feet above ground and there is right at 80 or 81 feet of ladder line hanging down and running to the window entrance panel on the side of the house in the backyard. To help alleviate some of my lightning worries, I added a Morgan Mfg. lightning arrestor to an 8 ft ground rod that’s connected to my main ground. Will this protect if the antenna takes a direct hit…no, but the arrestor does drain static electricity to ground before it enters the house and my rig. Of course, all my equipment is well grounded as is my tower and antenna mast on the hill. The antenna tuner by MFJ appears to be doing an excellent job. My SWR has been 1.5:1 or less on all the bands from 160 meters up through 10 meters. The auto tuner works by sending a weak carrier signal, 10 watts to be exact, to the antenna and configures to the best SWR possible. Usually, my forward power is better than 8 watts and almost always 0 watts reflected power. Very pleased with the tuner so far. One other thing I did buy was an old Astatic D-104 microphone and rewired it to work with my IC-7200. The D-104 is a pretty cool, chrome mic from the earlier days of radio…really looks cool with my callsign on it. I made my very first contact on HF during the “free loaders” net on 80 meters (3.947 MHz) this evening at 19:00 EDT with KK4KMB, Tony in Glen Lyn, Virginia running 40 watts. He, along with K4PLB, Paul in Moneta, VA gave me a good signal report…and boy was I excited and proud! I had no idea if the signal would get out, let alone if the D-104 was working correctly. Everything seems to be running smoothly. Lucky for me, we live in a very rural area and nobody close by operates radio equipment. Our power lines are all underground, and the only thing that could interfere with TX is a high-voltage power line right-of-way that’s about 2 miles south of us. Hopefully there will be no RFI or any interference at all on HF. No further contacts, just listening to various nets and rag chews across the country from California to New York this evening. Hopefully I’ll get some further contacts soon and will work all the bands with my good friend N3AO, Carter on Brush Mountain over towards Blacksburg, VA, in the coming days. Our cat Bigfoot inspecting the lightning arrestor and ladder line grounding...hope she gave it the okay! I did get some QSL cards made up by Jeff Gaskins, K4JSG, and they came out very nice. Also have ordered myself a large-print map of the world with all the important amateur radio info from a fellow ham in Russia (forget the call attm). I’m hoping to work some of the digital modes soon, especially the ARES bi-weekly net that runs Olivia, but also looking forward to trying out RTTY and maybe even CW. Right now, it’s time for me to relax and listen in on HF…73 de WX4SNO!